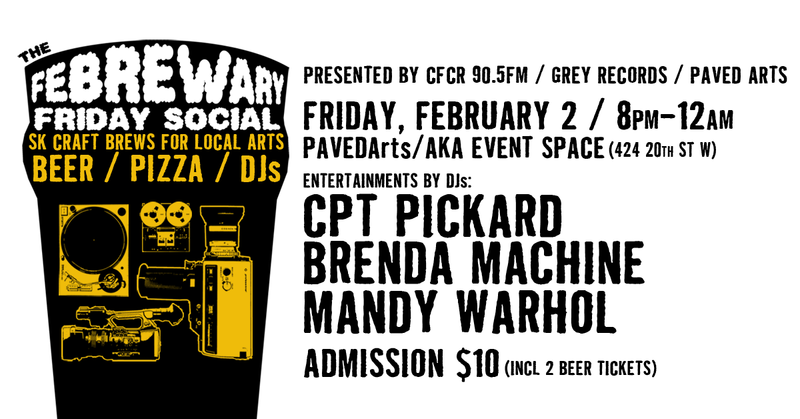 CFCR 90.5FM, Grey Records, and PAVEDArts present the Febrewary Friday Social! A well-rounded night spotlighting SK craft brewers, pizza, and music! Crack out your calendars and book off Friday, February 2nd from 8pm - 12am at PAVEDArts (424 20th St. W), and enjoy tasty beers from Black Bridge Brewery (IPA & Wheat Burst), 9 Mile Legacy (Angus Stout & IPA), Paddockwood Brewing Co. (The Miner and Red Hammer), and Nokomis Craft Ales (Brown Ale & Golden Ale). Quench your thirst with some of the best brews around, and hang with friends/meet new people while you're at it! What goes good with beer? Many, many things. Don't miss an opportunity to heat things up a slice of famous Nino's Pizza - live AND in person. It'll be a hot date, indeed. And don't worry, we'll have water on site so you can make sure you digest throughout the night accordingly. And as if that wasn't enough, DJ's CPT. Pickard, Brenda Machine, Mandy Warhol, and The Jay of Spadez will all be offering musical gems left and right. They'll be sure to have ALL of the hits that you've come to love and expect. To put a big cherry on top, Lindsey BREWuski (Ghost House) will provide visuals to enhance your night away. Additional beer tickets will be offered for 3 for $10, or $5 each. Proceeds of this event go towards Femfest 2018, our annual International Women's Day event for charity, happening March 2nd at Amigos Cantina (more details to come soon). Come support a great cause.